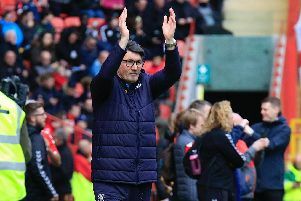 Interim manager Mick Harford felt the Hatters could consider themselves unfortunate to be knocked out of the FA Cup by Sheffield Wednesday this evening. The hosts created a number of chances throughout their third round replay against Championship opposition, but couldn't beat keeper Cameron Dawson, who made a string of fine saves. They were made to pay by Atdhe Nuhiu's deflected strike just seconds after the interval, as Harford said: "I thought they were magnificent, against a Championship team, we went toe to toe for 90 minutes. "They had a little spell in both halves where they’ve dominated possession a little bit, but never really hurt us. “I think chance-wise, shots-wise we dominated them and are very, very unfortunate to not come away with some kind of result. “I’m very proud of the players, the way they go about things, the way they’ve trained, the way they’ve worked hard, the way they played. “They’ve got a great attitude to winning for this football club and I’m really, really happy with the performance. Elliot Lee missed a glorious opportunity in the first half, blazing over, while Town's best chance of the night saw James Collins somehow divert Sonny Bradley's header on to the post with the goal gaping. Harford added: "We created all kinds of chances, we kept getting in. "I thought Elliot was going to hit it on his left foot, he chopped it back on to his right, the keeper also made a good save. while Jack Stacey got down the line. "Sonny Bradley's header back across to Collo where we’ve hit the post too, so overall I thought we dominated in terms of chances and corners and possession. "But these are a Championship team and if you give them a chance, they’ll nick a goal off you. "It was a scruffy old goal, but they’ll be delighted. "We’re so delighted with the performance and the effort the players are putting in though."